The Uplyme churchyard is exceptionally beautiful. In 2004, Uplyme Churchyard was voted one of the 12 Best Kept Churchyards in England, and that was out of more than 400 competitors. If you haven’t visited the churchyard, do pay a visit. It is an enchanting place. So who is buried in the churchyard? The most popular name is Harris with 24 in the Churchyard and Cemetery. Runner-up is Collier with 15 entries, hotly followed by Fowler (14); then we have Newberry (12), and then both of these with 11: Matthews and Irish; there are 10 Adams, Sansom, Bowditch, Smith and Gay. After that Brown comes in with 8, Allen & Furzey with 7, Benett with 5, and the also rans with 4 are Back, Baker and Bastin. Professions – Smith, Taylor, Butcher, Baker, etc.. In the 14th Century, the tailor made shoes and this is why we do not have the surname Shoemaker (unlike the Germans). Location – Green, Hill, Church, Lake, etc. Characteristic – Small, Irish, Large, White, etc. The Register of Graves was last updated in 2006. There are approximately 1415 entries in the book, comprising the names of those in 586 graves in the churchyard and 629 in the cemetery. There are also 200 recorded cremations with 86 cremation slabs. Eleven people are buried in the church. We keep a book in the Church which records all the names of those buried in either the churchyard or the cemetery and those who have been cremated. According to Dove’s Guide for Church Bell Ringers, Uplyme tower has 6 bells, with a tenor of 9-2-6 tuned to the key of G.
The church of St Peter and St Paul is a mediaeval building heavily restored in 1876. Our venerable yew tree is at least 1,000 years old. Inside, the handsome wagon roof of the Nave and Chancel are painted with gold stars. On the right from the entrance there is a fine stained glass window of the resurrection dedicated to the memory of Wilfred Parke, a very early aviator, who was killed in 1912 ‘by the fall of his aeroplane’ (the word “crash” had not yet been invented). Beyond the window is the Jacobean pulpit, which has 1616 (its date) scratched on. This is the year Shakespeare died. In the chancel are two interesting brasses dating from the 17th century. The east window commemorates Ann Ethelston, who died in 1854, wife of Revd. Charles Ethelston. He was the Rector here for 31 years and, in her memory, built the church school next to the church called ‘Mrs Ethelston’s School’. The reredos behind the alter contain effigies of Christ in Majesty in the centre, with St Peter and St Paul, our patron saints, on either side. An octagonal Saxon Font stands in the corner. Back in the nave on the north wall is a tablet to the Revd. James Stuart who was Chaplain to the King’s Rangers in South Carolina (The king was George III) at the time of the American War of Independence. The latest window to be installed is in the north aisle facing the door and depicts two incidents in the lives of St. Peter and St. Paul. In the 14th century the tower above, which hangs six bells, are two boards with the names of the 50 Rectors of Uplyme since 1259. The building has recently been developed to give a flexible space for different styles of worship and the children from Mrs Ethelston’s School are able to gather and use the space for their assemblies, drama and worship. The Victorian pews have been re-homed within the local community. The bell tower floor has been re-instated, where it once was, creating more space for our growing congregations. A complete rewiring and new lighting have been put in, replacing the condemned mixture of wiring and outdated light fixtures, which enhance the beauty of the old stone walls and the wagon roof with its golden stars. 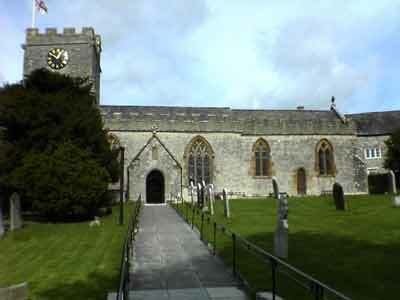 Uplyme Church is a warm, friendly place where you are very welcome to attend any of our many different worships. A history of Uplyme Church booklet is available at Uplyme Church for £2. This contains a fascinating, detailed history of the church with beautiful photographs.